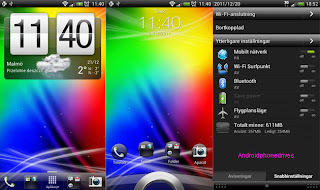 After Samsung and Sony Ericsson, we now have a beta ROM with Ice Cream Sandwich for mobile phones HTC.H ROM is still in very early stage and has several bugs but want to try it, you'll find it as always at XDA -Developers. As we see in the picture HTC has opted to keep its own Sense, and does not use the User Interface of the ICS. Firefox 9 for Android is ready to use. Christmas Themes for Android phones.